Biscuits sold nationally in Australia for 61 years! When you buy Girl Guide Biscuits you are getting delicious biscuits to eat plus you are also supporting Girl Guides Tasmania! Girl Guides Tasmania offers girls and young women a way to try new experiences and activities in a non-competitive and safe environment. The annual Girl Guide Biscuit campaign is between May and June and is Girl Guides Tasmania's biggest fundraiser. The funds raised will be utilised to advance programs, provide exciting opportunities for our members and help keep Guiding affordable for all Tasmanian families right across the state. Download some great printable Biscuit Recipes here. Our Traditional classic vanilla biscuit, a long-time favourite of all Girl Guide biscuit lovers. A crispy sweet - but not too sweet - biscuit ideal for morning or afternoon tea. Great to use in cooking and especially our Girl Guide recipes. A delicious butter shortbread with the benefit of being Gluten Free, it just melts in the mouth! Our Mini Choc Chip biscuits are 20% chocolate chips and make the perfect bite sized treat. With each crunchy bite, you taste the rich chocolate chips as they melt in your mouth. A delicious snack to satisfy your sweet tooth! Each box has 200g of mini choc chip biscuits so there are plenty to share with your family and friends. Where Can I Buy Biscuits? Contact Girl Guides Tasmania on 1300 GIRL GUIDES (1300 447 548) or email Guide House to find out who to contact in your area. 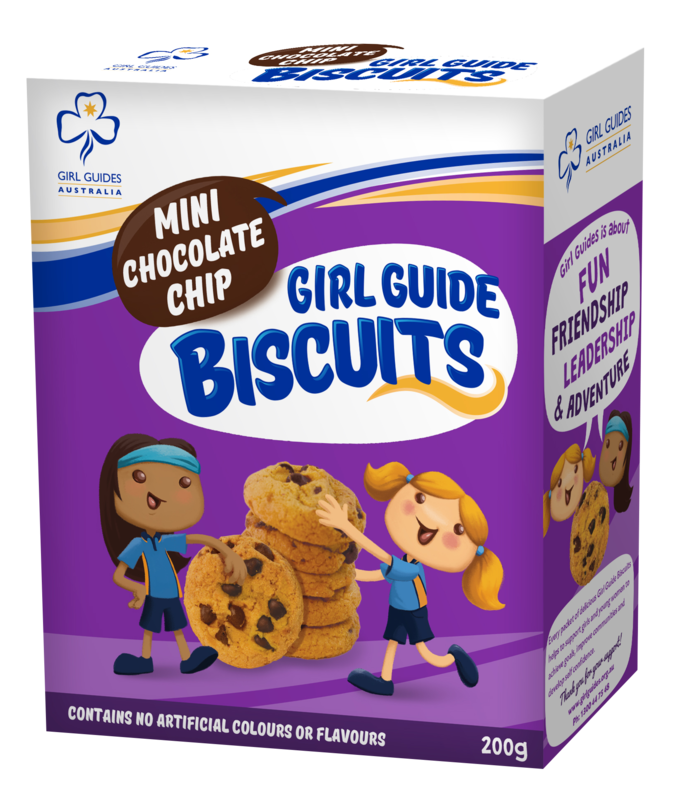 Girl Guide biscuits are manufactured by Modern Baking Company who are based in Melbourne’s Broadmeadows. They employ more than 170 staff and produce a variety of grocery products including ANZAC biscuits raising funds for the RSL’s many community programs. MBC is a values - driven organisation. Staff at all levels are encouraged to live by the core values of Integrity, Empowerment, Respect, Teamwork, Courage and Innovation. Modern Baking Company complies with current versions of the HACCP Guidelines and SQF 2000 System – General Food Processing – Level 3, as well as all applicable Act and Regulations for food safety in the countries in which we operate. The food safety and quality policies and procedures at MBC are based on these codes and industry best practice, and are consistently reviewed as part of their ongoing quality management processes.